Here are five names to have at your fingertips about the second World Cup, won by host Italy. Benito Mussolini. Il Duce had been in power 10 years when FIFA awarded Italy the tournament in 1932. Constructing lavish soccer stadiums suited the Fascist dictator’s penchant for grandiose buildings and he hoped for a nationalistic celebration amid the World Cup pageantry. Oriundi. Argentina, 1930 runner-up, upset that Italy had been poaching its players, sent a third-string team. Italy fielded four Argentine-born players of Italian descent, known as oriundi. Defending champion Uruguay, in retaliation for Italy’s boycott four years earlier of the Uruguay-hosted inaugural World Cup, refused to defend its title. Aldo Donelli. The USA and Mexico traveled 3,000 miles but had to meet in a qualifying game, which the Americans won, 4-2. Aldo Donelli, a Pennsylvania native who went by the nickname "Buff," scored all four goals. He later went on to be a famous college football coach. The tournament was a single-elimination from the get-go and Italy sent the Americans packing with a 7-1 rout. Wunderteam. The Hugo Meisl-inspired Austrian team was the best in Europe in the early 1930s, but lost to Italy, 1-0, in the semifinals on a goal that should have been annulled for a foul on the goalkeeper. Giuseppe Meazza. 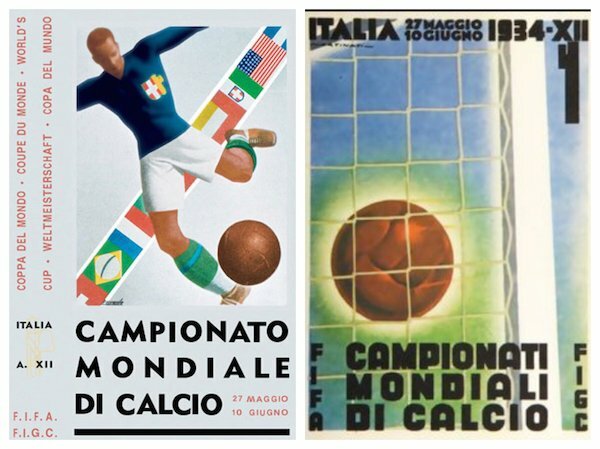 While the oriundi played a major role in Italy’s title win, the Azzurri’s star was Milan-born playmaker Giuseppe Meazza, who debuted for the national team three years earlier at age 17 and became Italy’s first world famous soccer player after leading Italy to a 2-1 final win over Czechoslovakia.